You’ve loved getting to know our tour guides from all over the world, so today we’re bringing you another guide interview! 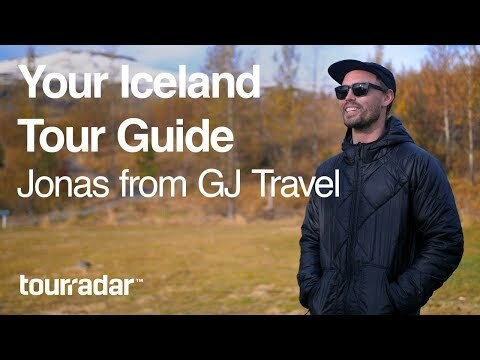 Today, meet Jonas Stefansson, a tour guide from Iceland, and watch as he talks GJ Travel, what everyone should know before they go to Iceland, his style of tour guiding, and much more. Get ready to wish you were visiting Iceland even more than usual! What’s special about Jonas is his connection to GJ travel. His great-grandfather was the company’s founder, and this family-run travel agency is still delighting visitors to the Land of Ice and Fire to this day! Touring is in Jonas’ blood, and it’s easy to see it during his interview. You won’t be getting any lectures on a tour with Jonas! He believes the best way to conduct a group tour is by letting travellers decide for themselves what they’d like to see. On his tours, he likes to explain the destination en-route, and then, once the group has arrived at the site, his travellers have the opportunity to explore on their own, or with guidance from him. This way, everyone gets to have exactly the experience they want, and no one has to compromise their vision of their dream trip. Difficult tour groups? Not on Jonas’ watch! He claims he’s never had a bad experience with a group – we think that has as much to do with the guide as it does the groups. Although, the biggest mistake he sees is travellers arriving in Iceland without the proper warm clothing and other important gear for a visit to this Arctic country. After all, he reminds us: it is called Iceland for a reason! One of the best parts of travelling with a local guide is all of the insider knowledge you wouldn’t get if you were travelling on your own. Some of Jonas’ insider knowledge? Don’t just stick to Iceland’s south coast! There’s so much beauty, culture, and rugged nature to be found elsewhere in the country, especially in the North, where Jonas currently lives. It’s no secret that Iceland is one of the fastest-growing destinations in the world, but that doesn’t mean there aren’t still plenty of hidden gems and off-the-beaten-path places to explore! If you can’t stop dreaming of visiting this incredible country for yourself, isn’t it time to book your own Icelandic adventure? Head over to TourRadar to find the best deals on this itinerary and hundreds of others.